The spiral symbolizes the path leading from external awareness to inner enlightenment and back again. Have you noticed when we you think of someone or something you appreciate that ‘grateful thoughts’ fill you with a positive, even loving feeling? It then becomes natural to reach out with acts of appreciation, joy and generosity. That’s what gratitude does. That’s what the spiral of gratitude is. The spiral is a globally positive symbol. Here are some of the meanings attributed to the spiral that we discovered during our research. Carl Jung, the famous psychiatrist, said that the spiral is an archetypal symbol that represents cosmic force. In ancient Britain, the spiral seems to have been associated with the feminine as the doorway to life. It has been associated with the cycles of time, the seasons, the cycle of birth, growth, death, and then rebirth. The cycles of time and nature are the cycles of life. Some consider the spiral a symbol of the spiritual journey. It is also considered to represent the evolutionary process of learning and growing. It seems that life doesn’t proceed in a straight line. The path of life most closely resembles a spiral. We seem to pass the same point over and over again but from a different perspective each time. To walk and then stand in the center of a spiral or labyrinth has been a psycho-spiritual exercise for centering the consciousness. The spiral has become the universal symbol for gratitude. 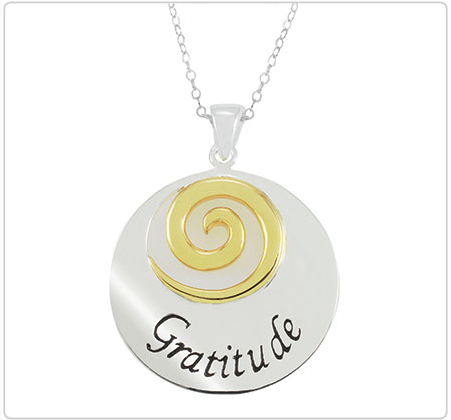 The Gratitude Spiral Pendant’s simple beauty is a reminder to celebrate and appreciate life and all of its abundance. 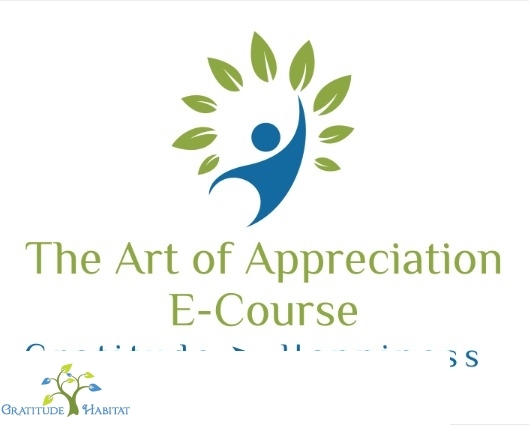 The spiral design connects our heart to our blessings while the word ‘Gratitude’ outwardly expresses our appreciation to the world. Complete with a 20-inch sterling silver chain, this 1.18 inch diameter pendant is a Gratitude Habitat exclusive design and one of our most popular products. Available NOW in both sterling silver and silver & gold, the spiral pendant is elegant and timeless, a perfect gift for yourself and the women in your life who inspire your heart. SPECIAL OFFER! For a limited time, use the promotional code SPIRAL and receive FREE SHIPPING & HANDLING when you order either of our gratitude spiral pendants. Offer valid through August 31, 2016.